Stay with me, says Giant Boy, I think I may die if I go to sleep. And so, the decision for the day is taken out of my hands. Giant Boy has a cold. He has a high temperature, and dreadful sore throat and ears, and needs his mummy. Mummy, making the right decision, instantly, gets another duvet and some big fluffy cushions from her bed, and makes herself a nest on his sofa in his room. Mummy, before she gets into her nest, gets her laptop, a large plate of toast and jam, and some earphones. It is only right, she says, as she gets comfortable, that a mother is there for her child. Giant Boy is 16. I woke very early today and fell out of bed onto my bike. Oh it doesn't matter, I told myself, if I go on an early morning bike ride in my pyjamas. My pyjama bottoms are too noticeable though, and by the time I ride home there would be enough traffic on the roads for someone to notice and not take me seriously. So I put on my jeans, a coat over my pyjama top, and was out in the byways and hedgerows by 5.15. It was cold this morning, cold and rainy. I did not feel the same buzz as I had felt on other mornings when the sun was shining, I did not feel that I was a glorious mote, dancing in the sunshine of life. I felt that I was a pudding in pyjamas struggling against the odds to have a meaningful early morning bike ride in the cold and wet, despite it being theoretically midsummer next week. "Bah!" I said, and continued. I remembered a leafy path, turning off the main road (main in this case means quite a busy back road at rush hours, surrounded by farms and hedgerows and often held to ransom by tractors going mental at 15 miles an hour), about five miles distant, and in a moment of inspiration, I made for it. What a good decision! The leafy track was narrow, winding and filled with wild flowers. The whole nature of my bike ride changed; I became an explorer, a feisty heroine in an Enid Blyton book. No longer cold, the rain now making my hair interesting and wild instead of plastered onto my head and silly, I followed a track and a sign to some barns in yonder distance. Rattling happily over bumpy fields on my bike, smelling the most wonderful wild flower smells, I not only found the barns (very nice), I found leafy tracks and exciting paths that led this way and that, to villages that I had never heard of. "What is this!" I cried to the rabbits loping off across the fields in the rain, "what are these mysterious places? If I go down these lanes and across these fields, will I be going over the hills and far away? Will I find a Dingly Dell under the Faraway Tree, and will I ever come back?" Well, I did go down those lanes, I did bounce and wobble across those fields, I did see birdies in the hedgerows, I expect I did see Dingly Dells and Faraway Tress, and I did come back. I arrived, an hour and a half later, at my front door in Bognor Regis. By that time, my fingers had more or less fused onto the handle bars with the cold and rain, and it was a good while before I got them off, and my front door open. I argued with myself a little on the ride. I am so tired, I told myself, I long for a day of dozing and dreaming. "You have work to do!" Said the stern voice inside that likes to get things done. "You have work to do and if you don't do it, the whole world will end", said this voice with great authority. "Oh well", I said as I cycled past the wonderful old houses still in their original grounds, with crumbling and magnificent walls around them, hidden deep in the countryside where they were once placed to be remote and rural and surrounded by nature, "Oh well. I will just have to drag my weary bottom into the studio and start the ball rolling." But lo! On checking Giant Boy at 7.30am, I found him crimson with fever, and filled with moribund thoughts. "Stay with me!" he managed to say, his giant arms flailing around my neck, "or I may die!" "Righto," I said, and made myself comfortable on his sofa, and here I am. A day of dreaming and dozing is mine after all. The world will not end, I am doing my motherly duty, and am keeping my boy from slipping into the next world by snoozing on his sofa. My weary bottom is in its rightful place, and tomorrow, oh tomorrow! It is a whole Other Place. It is Sunday, and I woke at 6 am as usual. But this morning, I simply could not move. Bradley, I said to myself, I know how you feel. Bradley is ill at the moment, and can't cycle. I am not ill, but I can't cycle, and that is how similar Bradley and I are. At 8am I went to make myself breakfast, and while I was in the kitchen, I felt a great surge of happiness, and put it down to three things. 1. I don't have to do anything today if I don't want to 2. The A Graceful Death engagements have gone really well this week 3. Breakfast is my favourite meal of the day, so bring it on. I am back in bed now, to write this account of things, and have my breakfast tray beside me. I am so tired that I have spilt my tea a little on the duvet. The mug is almost too heavy to lift to my lips, and my tiny little hands falter as I try to pick it up. And so, let us write this blog. My tiny little hands can still type, thank God. A Graceful Death went to St Catherine's Hospice in Crawley for three days this week. I was able to show the exhibition there thanks to a friend who works in the Hospice, who put the whole thing in motion. It was the first time it has shown in a Hospice, and I enjoyed it very much. I was so well looked after, I met some lovely people, and had some very insightful conversations with the staff as they visited the exhibition. 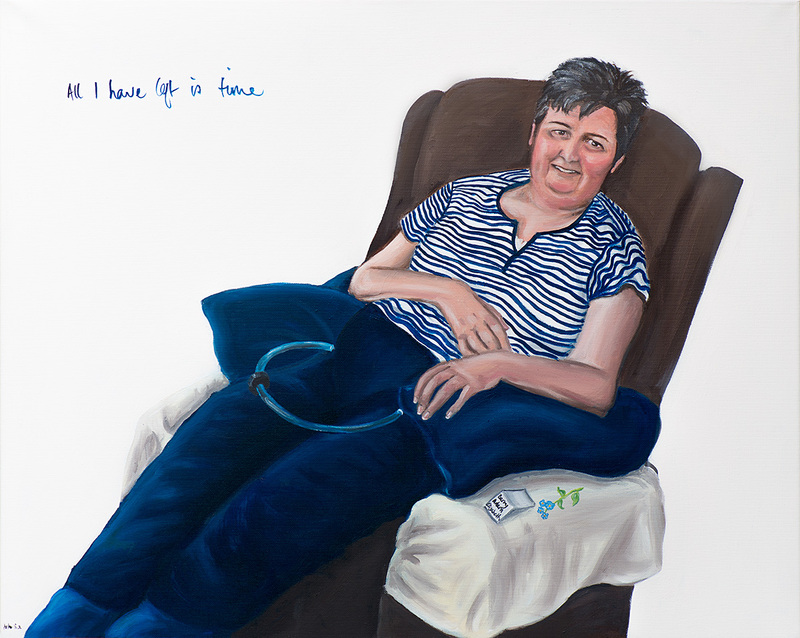 We did not show all the paintings, we did not show the very ill and dying Steve, as we all thought that it was not sensitive to show them in an environment where patients are dying just like that. And yesterday, Saturday, my friend Mandy and I put on a tiny weeny mini AGD exhibition in a Community centre in Chichester, with a talk from me about the work I do and what it all means, and a talk from Mandy on Soul Midwifery and vigilling at the end of life. It was, if I may say so, a bold move. We only had two hours, into which we crammed two talks, some mingling and milling, and the launch of Graceful Gifts, a range of thoughtful and loving commemoration gifts, condolence and bereavement cards, and items to buy to remember and love. I made two pounds at the launch, so I am at the very beginning of marketing this idea. I am very grateful too to Claire Rudland, who has made some very beautiful and thoughtful items to go into the Graceful Gifts. And, Claire's mother, has offered the most wonderful range of colourful knitted bags for us to sell, and I think they are the kindest, most wonderful things we have. The talks went well, and we met some very good new people. There is much interest in end of life matters, there is so much concern that we are missing something in dealing with our dying. The people who came to our talks all knew they could do something, and many had experiences in that field, but the feeling is that there should be something more. I am beginning to think that the "more" that people talk of, is not really more, it is permission to stop worrying and just be themselves. I think we are so afraid of upsetting people who are ill or dying, we don't want to be unmasked as inadequate and patently unable to do the right thing. 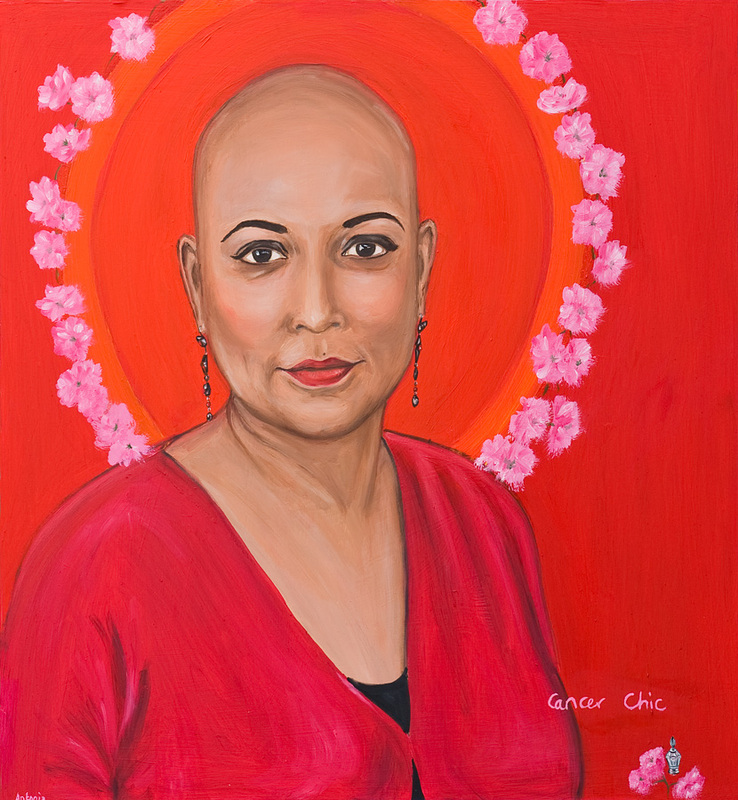 But, as Julia, the lady I have painted with Motor Neuron Disease said, she has been given a terminal diagnosis, what can anyone say to top that? She says, just talk to her. Sit with her. I am thinking that as a community, we need permission to treat dying, and those who are doing it, as normal. The professionals do a wonderful job, but that does not exclude us from taking part as members of the community, members of the family, and just being ourselves with our dying. Think about it, doesn't that sound simple? But it really is not simple, if you feel out of your depth, and that there is a secret to being with ill and dying people. The wonderful thing about Soul Midwifery, is that anyone can do it. It is not rocket science, it is not complicated, it is about coming back to basics, and honouring the dying person, and the dying process, without letting fear and conventions get in the way. And Soul Midwives do not have an agenda, we go with an open mind, and we take our lead from who we are visiting. As with anything worthwhile, Soul Midwifery, working with the dying for A Graceful Death, takes time and practice to make it work. The people who came yesterday to our event in Chichester, were already well on the way to making a difference, by just being who they were, and by being aware. 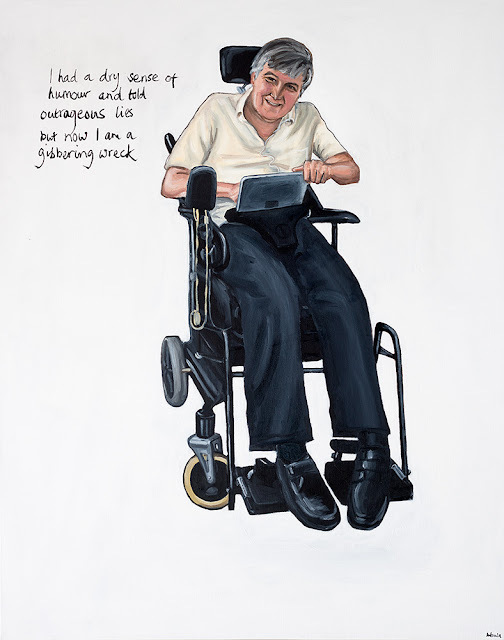 And now, here is the finished painting of Mike, with Motor Neuron Disease. The words on the painting are among the first that Mike tapped out on his keyboard for me when I first met him. Those who know him well, tell me that this is typical Mike. I have been asked to talk about A Graceful Death and the work I do at Brighton University Medical School in October. The paintings will be on show for the evening, and I will talk about what I do and why. The university has an interest in neurological diseases, and so Mike is coming to give a power point presentation with me, on having MND. He is going to stay for the question and answer session, and will use his keyboard to reply. I am so excited about doing this, and having Mike's input. After all, he is the one who knows what MND is about. Julia has taken a year to become almost completely immobile and unable to talk. Mike has taken ten years to get to this stage. The Julia painted here, does not look like this any more. She is thinner, and has a neck brace, an oxygen mask, a feeding tube into her stomach, and she cannot say more than a few words. Her throat does not work, and she cannot use it. On the arm of her chair, is a piece of paper with the names of her husband, Barry, and her two children, Adam and Elizabeth. There is a forget me not with four flowers next to the paper. Eileen, my photographer and film maker friend and colleague, and I are hoping to interview Julia on film to use in October for the students in the Brighton Medical school. Julia is gentle and serene, and suffering greatly in not being able to look after her family any more. Her husband Barry, does everything for her and is, like all carers, an unsung hero. And so. What now. Well, today is given over to exaggerating how tired I am if anyone is looking. I am driving to my mother's house today at lunch time, to collect Giant Boy who is staying with her. Mother goes to cash and carry before he arrives so that she has enough to keep him from starving to death. She is experienced, she has raised four children, three of which were large and hairy boys and one of which was me, and I am no shrinking violet when it comes to meal times. Soon, I will get up, and stagger to my car. Oh, that reminds me, I left a folding up bookshelf at the Community Centre last evening, I must go and find it. It is a measure of how tired I am that I look at the blank space, with piles of books all higgeldy piggeldy on the floor around it, in the hallway where it used to go, and think Oh it doesn't look that bad. Oh maybe someone has found it and needs it more than me. Oh maybe I will just go back to sleep. No. I will channel Bradley, and get up. Bradley wouldn't stay in bed, even if he couldn't cycle that day, and leave a bookshelf in Chichester at a Community Centre. Bradley would push aside his breakfast tray, put his lycra back into the cupboard, get dressed and stagger to the car with grim determination in his eyes. And later on in the day, Mrs Bradley would look at him with adoration, as the books from the floor are back in colour order on the bookshelf that spent the night outside a Community Centre in Chichester. And all is right with the world. And on that happy note, Bradley, let's go. This is going to be a bijoux blog, because I don't have the time to do otherwise. Put your phone on silent, and concentrate. I am going to be happy, of course, but brief. You will need to focus, so that you get the best from it and feel properly informed. What have I been doing? Indeed! What have I been doing! Let us race through it in bullet points below. Every morning for the last two weeks, I have been rising at about 6am, and going for a cycle ride. Goodness knows where the impulse to do this has come from. But, some menopausal hormone has been released into my brain and I am compelled, with joy, to spend between half an hour and an hour cycling around the Bognor area as the sun rises. Oh I cannot tell you the pleasure the lovely country lanes and byways give me. And so, because I am hurrying, I won't. But they do. Even when it rains and the gears get stuck at number five and I need a wee. Mike and Julia have Motor Neuron Disease. 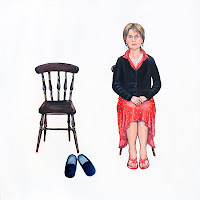 Both are taking part in the AGD exhibitions, and I was taking taken far too long to complete their portraits. And so, I took to the studio, toothbrush and overnight bag at my feet, to finish painting. Boy Giant was left a map of the kitchen, some clues about food hiegene, and a new squeezy mop to wash up after himself. "I cannot be disturbed," I declared, and "You are disturbed enough already", was his reply. 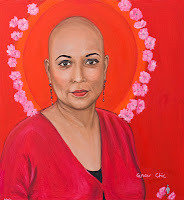 Julia's health is declining fast and I needed to show to her the painting as promised, and to go back to see her. Both portraits are now finished, and I drove, paint in my hair and bags under my eyes, to the New Forest last week to show them. It went well, and both families were pleased with the results. But Julia does not look like her portrait any more, she has lost weight and has a neck brace on. She has a feeding tube directly into her stomach, as her throat does not enable her to swallow properly now. The lady I painted was at another, earlier, stage of the journey, and I was a little sad to see that she had moved on so fast. She can only say a few words now, and managed to say that soon, when she can't speak or move at all, she will communicate only with her eyebrows. We all thought that was funny but really, it isn't. It is awful. And that is precisely what Julia will have to do. I asked her what I should write on her portrait, and after many tries, she managed to say, "All I have left is time." So I have put that in the painting. Mike is nuts, and what I have put on his painting is, "I had a dry sense of humour and told outrageous lies but now I am a gibbering wreck." These are among the first words that Mike tapped out to me on his computer when I first met him. Payback time. Monday 13 May to Wednesday 15 May, A Graceful Death is showing at St Catherine's Hospice, Crawley, for Dying Matters Awareness Week. Open Evening is Monday 13 May 4.30 - 6.30, I will be talking about the work I do, and introducing the exhibition. Tuesday 14 May is for the Hospice and the staff, and Wednesday 15 May is open to the public from 9am to 7pm. Come, it is a wonderful Hospice, and you are so welcome. If you come later in the day on the Wednesday, remember that I will have been there since 9am, and it is your duty to bring me biscuits. If you want a sensible conversation, some chocolate will do the trick. Just mentioning it. September! I am going to show AGD, and talk to the students at Brighton University about the paintings that I am doing with MND sufferers. For this project, Eileen and I are going to film an interview with Julia and her husband Barry, as soon as we can. We need to move fast, so that the interview is not just conducted with eyebrows. Mike, and his wife Michelle, are going to come and take part in the talk. This is so exciting. Mike is clever and amusing, and good at communicating, he will be wonderful. He will prepare a power point presentation, and I will interview him on his computer keypad. It is all go, and I have found another man I want to paint for the exhibition. Having said I won't do any more after the four I am doing this year, I am ignoring myself and planning another. Eileen has just gone home, she came for the weekend. £5 entrance fee. All proceeds will go towards funding the A Graceful Death project. It will be lovely to see you. Bring chocolate. On sitting in the garden and waving workmen into the house. Today I sat in the glorious Bognor sunshine, in my garden that has suddenly produced glorious bright green grass with daisies and dandelions in it, with Lizzie Hornby, Musician Extraordinaire and composer for A Graceful Death. We sat in garden chairs with our lunch on a tray on the large trampoline which we used as a table, and from there, we waved carpet layers, delivery men and boiler repair men in and out of the house as if they were our dearest friends. I looked out into the sunny garden from the studio at one point, having had to pop in there to answer a phone call, to see Lizzie preceding a ginger haired and tousled fellow into the garden and then into house through the garden doors, and I wondered what he had said to her to gain entry into the house. What ho, I thought, I wonder who that fellow is? And then I forgot about it to continue my phone call. I felt very mellow, what with the garden looking so green and fresh, and the sun shining hot and bright around me. He must be one of the blokes coming to do something or other to the house, I thought, briefly, and Lizzie knows how to defend herself if he isn't, and wants only to do a bit of murdering, or something. Nothing fazed us today. The carpet man arrived early at my studio door and looked delighted to be talking to an artist. Before I could say, walk this way my jolly carpet laying friend, and lay me a carpet to make my friends and neighbours gasp, he began to talk about the paintings he was doing at home. I could see that he wanted to come into the studio and see what was going on, as I was looking the part, covered in paint and wearing very old clothes, but I have learned that you need time to come into the studio and have the paintings of dead and dying people resting against the walls, explained to you. He was very curious, but Lizzie was due any minute, there were other men due to do stuff in the house, and I needed a new carpet laid. So I closed the studio door behind me, by stuffing a sock in the door to keep it closed since the lock and handle fell off, and led him into the house. Soon, a little while later, Lizzie and I were sitting in the sunshine together, talking of the way the world works, and of how the creative process cannot be put into words, and how much we liked eating. As we were on our second pot of tea, the carpet man severed an electric cable of some sort, and a faint alarm went off in a cupboard under the stairs. "Don't worry", he called through the window, "I have called a man in Croydon and he is on his way. He will fix it. But as he is in Croydon it will probably be later rather than sooner." "Will that be today?" I asked. "Yes", he replied. "That's OK then," I said, "carry on and I will close the door on the faint alarm under the stairs, and if I can't hear it, it does not exist. Life is too short and the sun is too hot, to worry about the severed cable." More men arrived to work on the boiler, to check on the carpets and to deliver items. Lizzie and I continued to laugh and sunbathe in the garden, and I thought - how amazing that I sit here outside with a friend, while inside the house, men bash and hammer and tweak and fiddle, so that when they are gone, I have a better home. This is important. Since Monday, my phone has broken, my laptop has died, my boiler has exploded and there are ominous cracks in the ceiling on the landing. So far, I have a nice new carpet. The men are still working on all of the other things. I shall let them get on with it, and will have hot water again, I am told, by the tousled haired red head that Lizzie took into the house through the garden today in the sunshine. I shall have hot water again, he said, next week, when I decide what to do over the bank holiday weekend and tell him of my decision. "Fine," I said. "Switch on my immersion heater, that will heat some water in the mean time. Life is still too short and the sun is still too bright to worry about hot water". And so. I sit here tonight in my house, the men all gone, and the doors all shut. Lizzie left a good while ago and the immersion heater has heated enough water for me to have a teeny bath. I have a lovely new carpet, the severed cable has been mended by a man called Dave, or Bob, or something, and the carpet man boss turned up this evening to check on the work. "Come in!" I cried, "the house has been filled with working men all day, and you are welcome. Come into the kitchen to talk carpets while I cook." My laptop is at the menders, my phone is due an upgrade next week so I am holding out for that, and the cracks on the ceiling can only be seen if you look upwards while standing on the landing. So I shall look straight ahead of me, or downwards, and sort it out that way until I find the next man to come and do something about it. 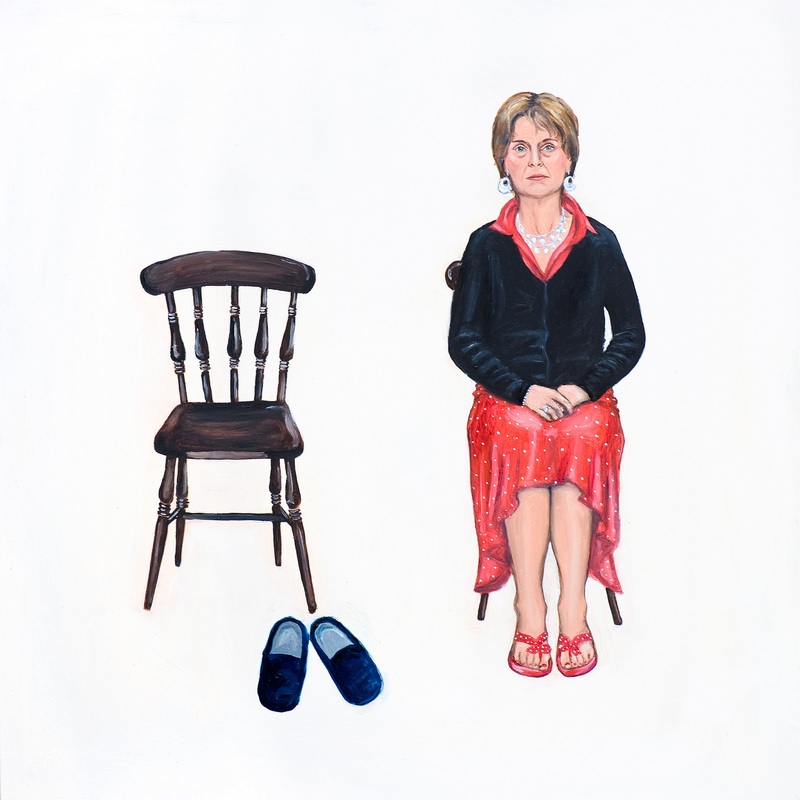 Oh, and the phone call I took in the studio was from Brighton University, where I am to deliver a talk on my work with the dying through A Graceful Death, with emphasis on the Motor Neuron Disease portraits of Mike and Julia. And the exhibition will be shown there too. Life is good, eh?